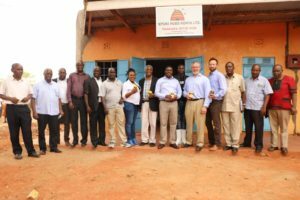 This month, World Food Bank CEO Richard Lackey and GFE Investor Justin Culver visited Thakara-Nithi County in Kenya, where they were heartily welcomed and given a personal tour of local food systems and producers by County Governor Muthomi Njuki. 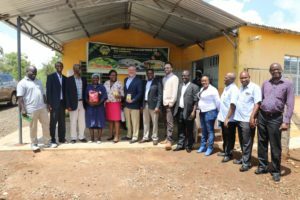 Governor Njuki is a supporter of the work the World Food Bank is doing to improve the agriculture sector in Kenya and across East Africa. Stay tuned for more about our work in Kenya to come or email us today to learn how you can get involved. 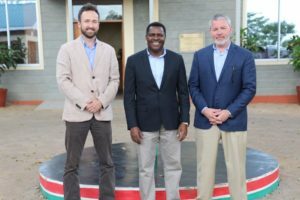 GFE Investor Justin Culver, Governor Muthomi Njuki, and WFB CEO Richard Lackey in Kenya. 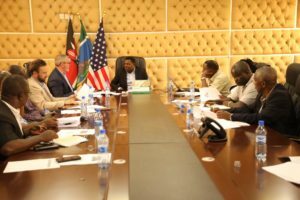 Meeting with officials in Thakare Nithi County in Kenya. 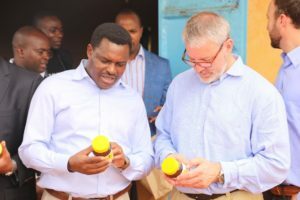 Governor Njuki and Richard examining jars of locally made honey. 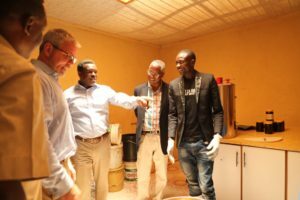 Touring the operations of local food producers. Meeting producers at Sweet and Dried Enterprises, which produces dried fruit and vegetable products.